Westmorland House in Stokes Croft, the only modern tower block in a heritage streetscape, has dominated the area since it was built. Westmorland House from Bond Street. Derelict since the 1980’s, it’s hard now to imagine Westmorland House as a dynamic, modern, exciting and state of the art office building. We wanted to know more. The Heritage Lottery Fund supported a project run by Montpelier Conservation Group and CAG to find out more. 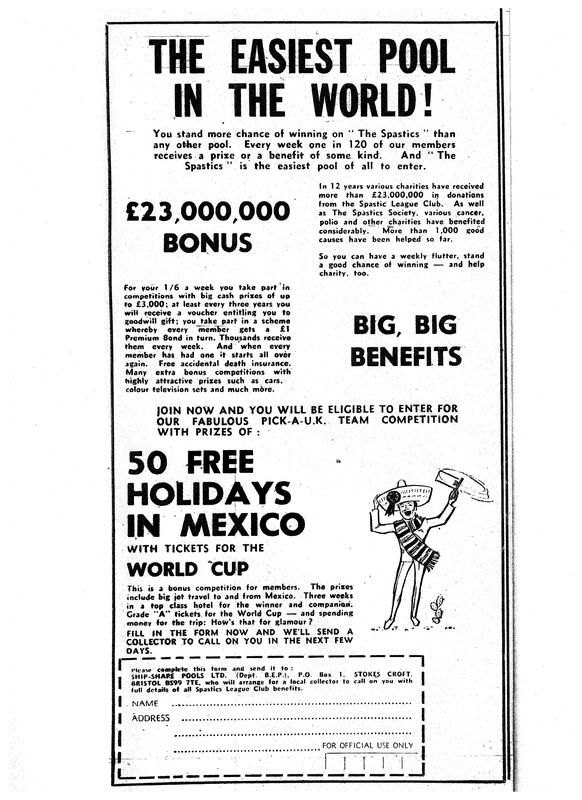 The story begins with Regional Pools Promotions which despite its name, was a national organisation that was launched in 1957 in a small office over a shop in Whiteladies Road. 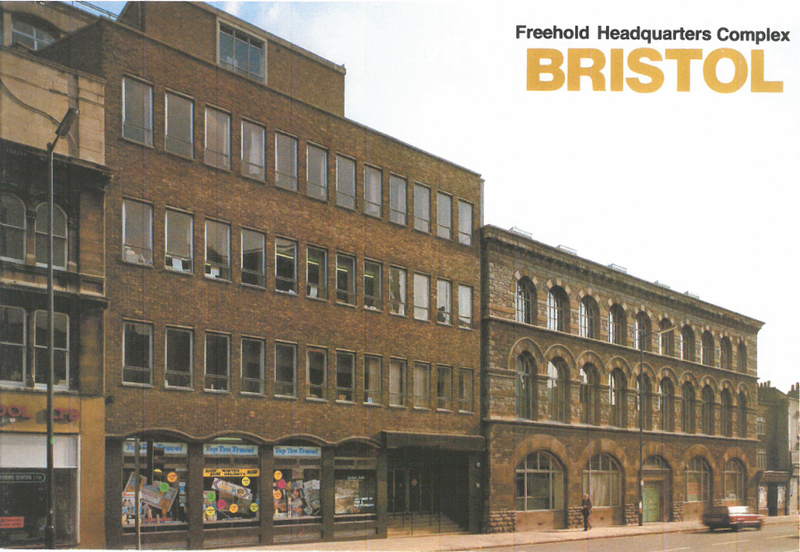 As it grew it moved to what is now the City Planning Office in Brunel House, then to Bedminster and finally to Stokes Croft – initially into the Perry’s Carriageworks building. Regional Pools Promotions (RPP) was a membership scheme through which members could win prizes. Members paid a shilling a week subscription. Tuppence (2d) of this was sent straight to the organisation we now know as SCOPE, then called “The Spastics Society”. 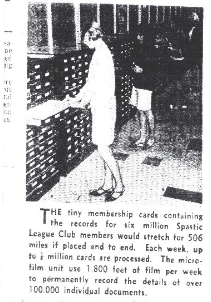 Members were part of the “Spastics League Club” and the whole set up was known at the time as “The Spastics Pool”. Older Bristolians still know Westmorland House as “the Spastics Pool Building”. The language used then is difficult – and insulting – today. All of the documents about RPP use the language of its day and we have used that language to tell this story. We spoke with people who worked at Westmorland House, and others who knew it as a working building. You can listen to their stories as part of this project. We believe that RPP was the first organisation to raise money in this way for charity. An article in the Bristol Evening Post (September 26th, 1967) to mark the 10th Anniversary of RPP states that “There was absolutely no precedent” for this kind of scheme. It had a bumpy start, but within ten years, it had become a national institution. 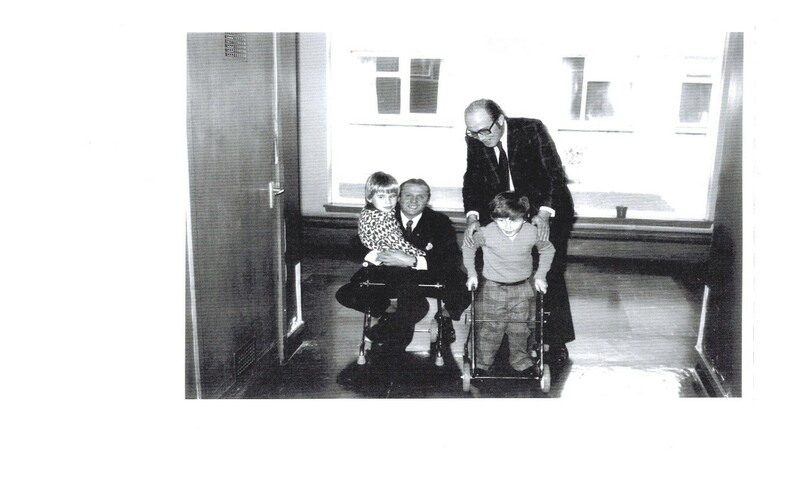 In 1969, RPP had raised £37 million (the equivalent of £120 million today) for the Spastics Society. In the 1970s, 42% of the Society’s include came from RPP. It supported schools, social work, employment workshops… and more. From Westmorland House: the staff in house journal. Thanks to Alan Holloway. 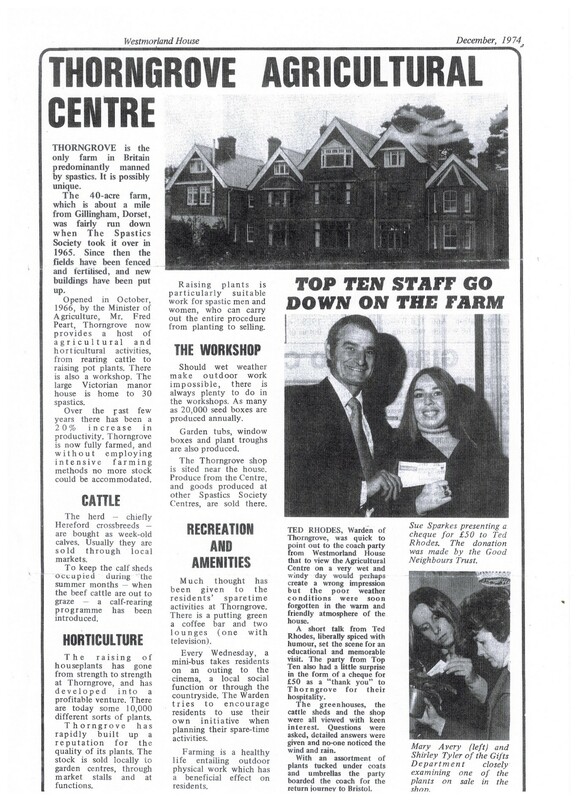 RPP’s staff paper, Westmorland House, described one of the Centres that was supported by funds raised through RPP. 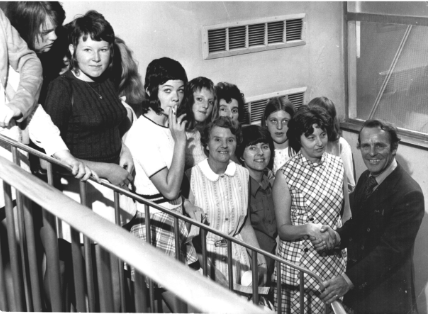 The company enabled some of its headquarters staff to visit the facilities run by the Spastics Society, as this encouraged staff to act as ambassadors for the scheme. People joined because they could win prizes in a weekly draw. A cash prize of £20,000 would be the equivalent of about £300,000 today. 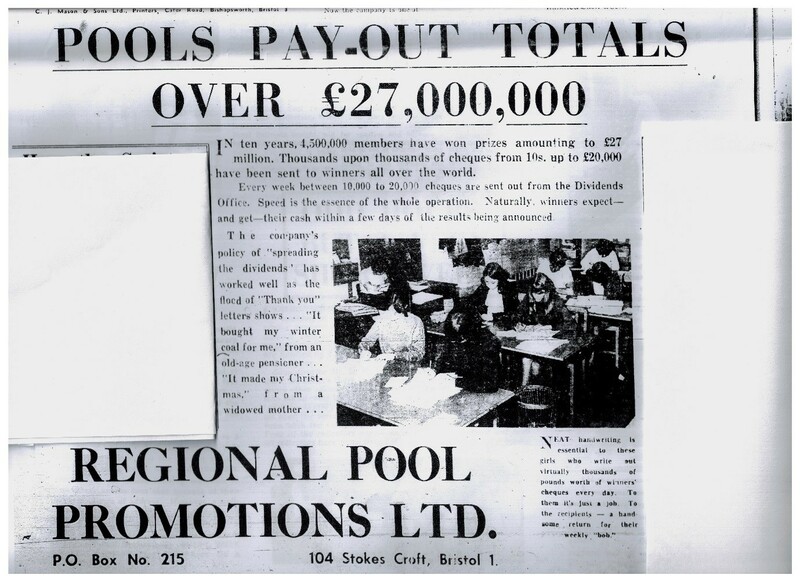 In 1967, the Evening Post reported on the amount of money that had been paid out – and the range of prizes that could be won: “from 10 shillings up to £20,000.” Regional Pools Promotions was the first of what we now call “society pools”, and was a trail blazer in charity fundraising. No-one we have met with knows how the prizes were drawn. It had something to do with the football results. We are still trying to find out all the details! If members did not win a prize for a period of time (every two or three years), they would be awarded a gift. We have not found a gift catalogue – we’re still looking for one! 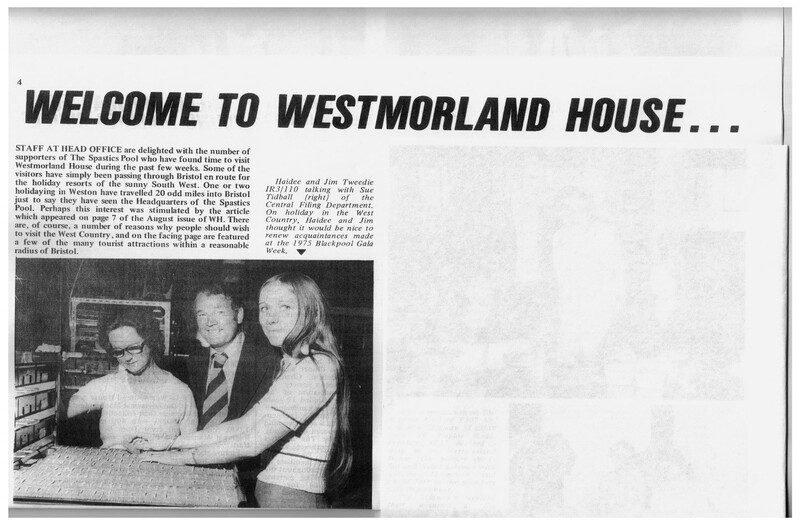 Comedian Dickie Henderson visiting Westmoreland House – shaking Pat Kimber’s hand. Thanks to Pat Kimber for this photo. Regional Pools Promotions was a runaway success. At its height, in 1969, it had 6.7 million members. And that called for a bigger headquarters building. The planning application, which makes reference to some of the new “gadgets” that would be built. 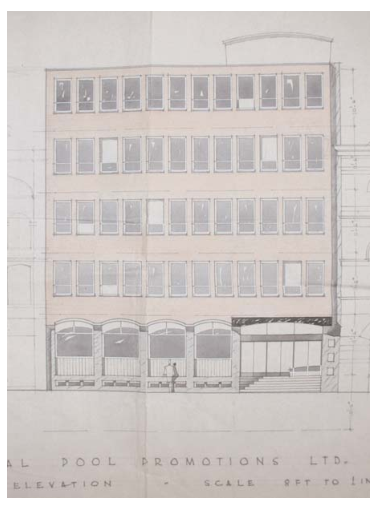 Westmorland House was designed by Bristol architects Ivor Day & O’Brien and built at an anticipated cost of £275,000. The design had a high specification. External walls were of brick and precast stone, with granite coloured panels between the windows and an asphalt roof. There would be both passenger and goods lifts, “Royal Blue Pearl Granite facing in the ground floor lobby” and vinyl tiles throughout the officers and corridors. There would be a “Health Unit” (described to us as a sick bay for staff), and a “large conference room with an elliptical roof light over the tables”. This was in the Board Room. You can still see the window shape from Ashley Road. To manage the parcel traffic, there was a Loading Bay at the back, with a turntable. It was a bespoke design that allowed vans to turn around in small space. The audio tells you more about this! 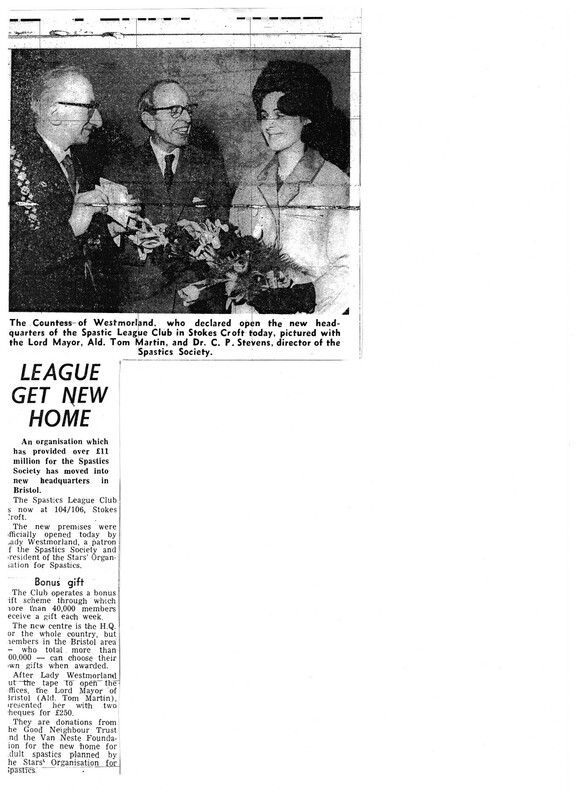 Westmorland House was opened on 14 January 1966 by the Countess of Westmorland. She was a patron of the Spastics Society, and we assume gave the building its name. It was a modern building, light and airy and described as a clean and nice place to work. There was a shop displaying the prizes on the ground floor – visible through the large windows, and in the grand, terrazzo stone floored entrance foyer, there was a slate map showing the whole of the UK. A semi-precious stone marked the location of each Collector. Geof Twining, who was the Project Manager for the build, described how the all of the walls of the substantial Board Room were panelled with Nigerian Pear Wood. When you were in the room and the doors were closed, it was not possible to see where the door was, other than by the single, chrome plated door handle. All the panelling was made in the joiners shop of the local building company, Stone and Company, who were responsible for the build. Purpose built for RPP, the offices were functional. Movable partitions meant that all of the working spaces could be changed and adapted as the organisation itself changed. Sue Holloway described the desks as being more like “Meccano style” trestles with wooden boards on top. This also allowed for flexibility, but, unlike the Board Room, the offices were “nothing fancy”. This PR photograph, from Sue and Alan Holloway, is one of the only pictures we have of the inside of the building. We would love to see more – of the offices, the show-room, the slate map, and the Board Room. 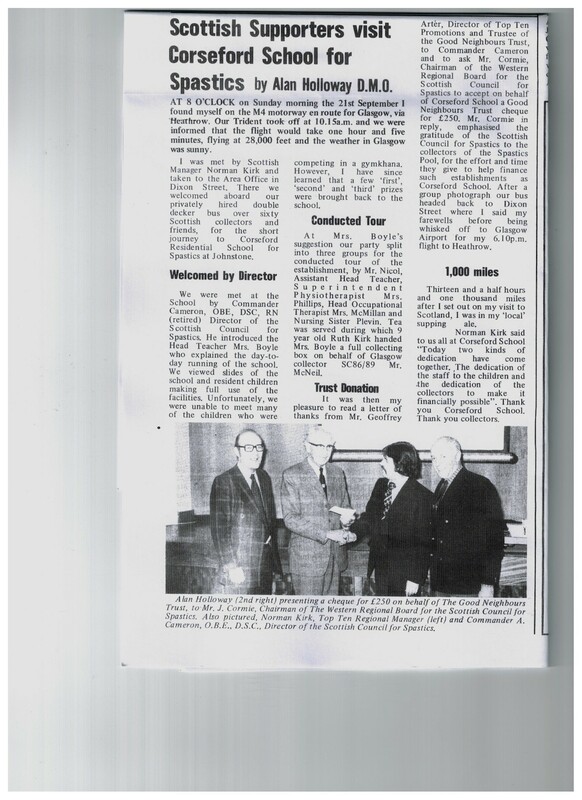 The Evening Post descried RPP as “a welcome addition to the city’s already widely varied industries”. It employed about 500 full time and 250 part time staff – mostly women. Most were engaged in clerical work to keep the complex operation going. This was the pre-computer era, and work was repetitive and detailed. It involved keeping track of all the memberships, all the changes to memberships, and administering all the prizes. Most of the people we spoke with who worked for RPP said that it was a good place to work, with flexible working for women – unusual at the time. Most of the staff were women. They were paid well enough to be able to afford the fashions of the day! Men were better paid, and most had managerial positions in the company, or handled what we would now call ‘customer complaints’. The Central Filing Department was the hub of the organisation. 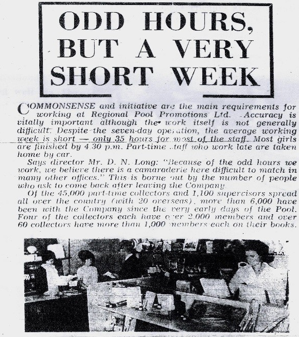 Several people, including Geraldine Box, Sue Holloway and Veronica Bowerman, told us about the small cards that were filed in drawers… Little green cards, about 3 inches by 4 inches, with each person’s membership number, their address and the collector’s number. Whenever there was a change, say a change of address of collector, the card would have to be changed by hand. Veronica Bowerman told us that the card was in three pieces. The collector kept one part of the card. The other two parts were sent down to RPP. One part was put in a numerical system, in what was called the Records Department. The other part was filed by Collector, in the “Reference” section. Banks and banks of drawers and cabinets – with 6 million members, there would have been 12 million little cards! As a progressive organisation, RPP was an ‘early adopter’ of the new computing technology. Across the country, there was a national network. Veronica Bowerman explained how “the members paid the collectors. The collectors completed a return. The return went to the Supervisor. The Supervisor amalgamated all these collectors’ returns” and sent them to the headquarters in Westmoreland House. They were sent by Royal Mail. No-one we interviewed was aware of anything being lost in the post! Four managers handled the Field Network. One was Alan Holloway. Theirs was a job with an unusual amount of travel for the time. An unusual journey for the time Thanks to Alan Holloway for this copy. They looked after the Supervisors, helped to recruit new collectors, arranged training for the field network and visited their regions to troubleshoot, and to promote RPP. 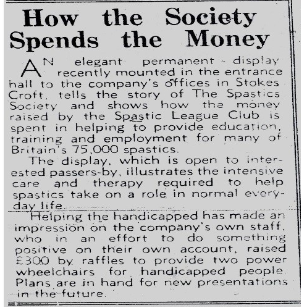 This PR function included visiting Spastics Society centres, presenting cheques, and making connections between members and their subscriptions and the “good causes” that a part of each members’ subscription supported. People liked working in Stokes Croft. It was easy to reach on bus routes from all parts of Bristol. It was close to the city centre, which made it easy to get to Broadmead, or to socialise in town after work. And Stokes Croft itself was a good High Street in its own right, with a lot of shops – all independent and catering for a wide range of needs. You could get just about anything – there was a kitchen shop, a furniture store, Bendall’s the Grocers, at least two bakers, a butcher, and a chemist that had a solid business selling make up to the women who worked in Westmorland House. There was a dry cleaners on the corner of Jamaica Street, and a hairdressers, opposite Westmorland House, always busy creating beehives and back-combs as was the fashion of the day! Then, as now, the area was known for its diversity. Several people described the more interesting and unusual stock sold in the area (but virtually nowhere else in Bristol at the time): the hitherto unheard of stuffed vine leaves in the Greek deli near the corner of Nine Tree Hill, and the then unknown kiwi fruit, described a “looking like a hairy sort of gooseberry”! A thriving shopping area, then. 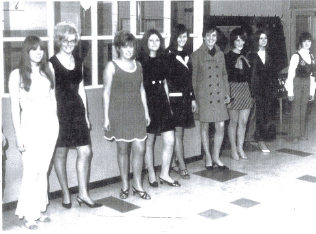 We are still looking for photographs of the area in the 1960s and 1970s. 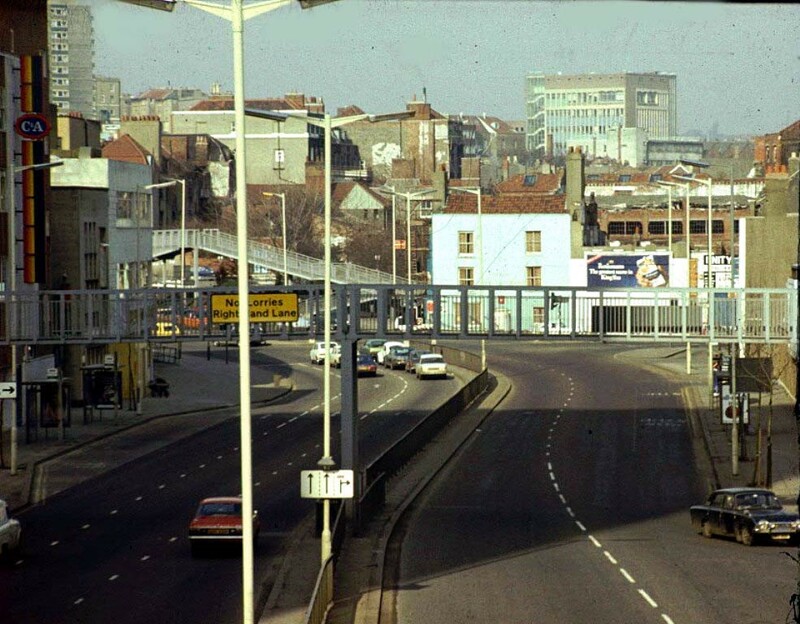 Regional Pools had moved out of Stokes Croft by 1982. The demise of Regional Pools is a complicated story. The building was sold. As far as we know, it has not been occupied legally since then. The windows were smashed and removed in the 80’s, rendering the buildings derelict. The decline and dereliction of Westmoreland House has blighted the area ever since. Westmorland House – we still want to know more about it! The Heritage Lottery Funded project has finished, but we still want to know more….and we want more images, especially of the inside of the building. If you have any information about Westmoreland House, photographs, or stories to tell about it, please email stories@carriageworks.org.uk. We will contact you as soon as we can. Thanks to the Heritage Lottery Fund for their financial support; and to Montpelier Conservation Group for enabling this project to happen. Those who we interviewed: Christine Bennett, Veronica Bowerman, Geraldine Box, Andy Burkitt, Barry Cash, Eileen Coggins, Alan Holloway, Sue Holloway, Pat Kimber, Geof Twining, Nick Williams, Geraldine Willis. And those who sent in their stories: Wendy Wiltshire, Diana Davies, Paul Wheatcroft. Thanks to Tot Foster, for advice, support, training, and for editing the audio material. The album Astral Gate by Lucas Perný a Miloslav Kollár is licensed under a Creative Commons Attribution-NonCommercial-NoDerivatives 4.0 License. Other musical stings – Swing City, 44th Street, from Apple Final Cut Pro X sound effects. My old man won £1800 I think it was on the “Spastics Pools” as it was called in those days. He was presented with the cheque by Norman Vaughan of Sunday Night at the London Palladium (as seen on tv!) fame. This was 1974/5. It was covered by the Evnin’ Poast but I don’t have a copy. I wasn’t very interested as I recall. The Pools company operated out of the carriage works and it was a busy very well known landmark. I never went there but wish I had now. Good luck with the research Lori.